Below you will find a list of discussions in the Galaxy Nexus Site News forums at the Galaxy Nexus Forum - Samsung Galaxy Nexus Community. 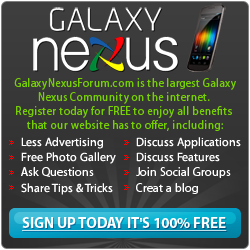 The Galaxy Nexus Site News forum is for discussion of: Galaxy Nexus Site News including contests, giveaways, and more..
Sticky: Welcome to GalaxyNexusForum.com - A Samsung Galaxy Nexus Community! The Spotlight Member of the Month is: arborij! Android Rocket & Aeronautics Commission (ANDRAC); Sending Andy Figurines Skyward! The Spotlight Member of the Month is: JaeKar99!